I know, I know! One day I’m tempting you with Snickers candy in your banana bread and the next, a salad??? In this season of excess, a salad is just what the doctor ordered! Most college freshmen gain the traditional 15 pounds. Our youngest actually lost almost twice that and asked me to cook him Mediterranean food when he arrived home for Christmas break. What? No cheese steak requests? Taken off guard I looked in the pantry, fridge and freezer to scrounge the making of a meal on the spot. And so was born this recipe, an improvised Niçoise salad of sorts. 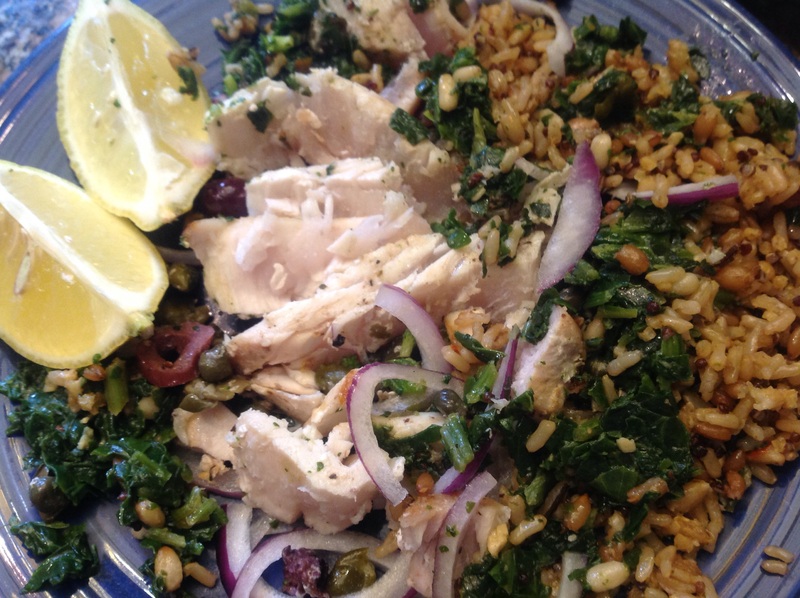 A sizzling Ahi tuna steak seasoned with capers and Kalamata olives served alongside whole grains and garlicky sautéed spinach. 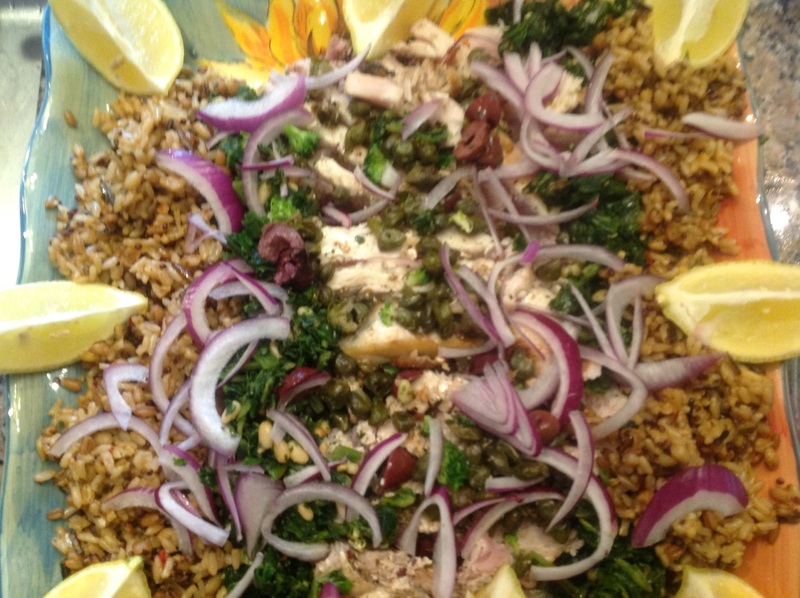 A tasty lunch evoking the Mediterranean and keeping this young man on his healthy journey. The salad just might transport you to a quaint little Greek island, escaping the hustle and bustle of the holiday season. I could escape there myself, right about now! Method: In a frying pan, heat 2 T of the oil and quickly sear the tuna steaks, about 2 minutes per side for pink, with the capers and olives. Remove and season with freshly ground pepper and keep warm tented with foil. In 2 T of oil, sauté spinach with the garlic until wilted. To plate: slice the tuna across the grain and fan across the center of your serving platter and top with the capers and olives. On either side of the tuna, spread the spinach. Next to this, spread the grains. Top with the sliced onion and pignolis and serve warm with lemon wedges. I’m sharing this with my firends at Fiesta Friday hosted by Angie @ The Novice Gardener because we all need to get back on the bandwagon after all the holiday celebrating! 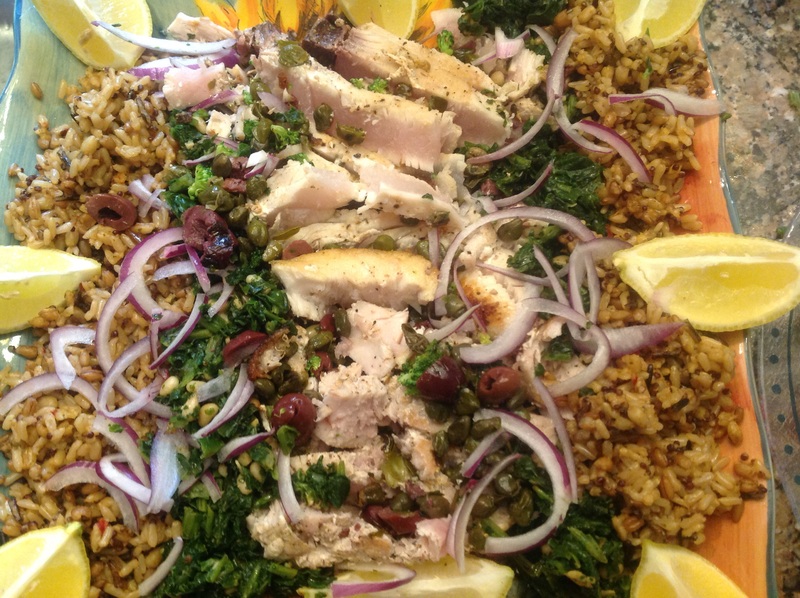 This entry was posted in Recipes and tagged grain salad with seared Ahi tuna and spinach, Seared fresh tina salad, warm grain Mediterranean salad by Johanne Lamarche. Bookmark the permalink. How beautiful, so healthy and just wonderful that you had whipped that up with all you had for your starving college kid :). Love the picture of Greece, love the Mediterranean :). Responding so many days after your kind comments on this recipe I feel like I did check out somewhere in the Mediterranean, Loretta! Regretfully not! Just crazy busy with holidays! Thanks for dropping by. Happy holidays! First, Ginene, your header photo is GORGEOUS!!! We haven’t seen sunshine here in the Kansas City, MO area for weeks, and it’s cold out. So I’m in agreement with you…I would MUCH rather be lounging on the Mediterranean!!! Your kid LOST nearly 30 lbs. as a freshman??!?!??! What on earth?!??!?!!! MEN! They truly are the lucky ones! It’s nice, though, that he can turn to Mom for food he loves and craves and that you can put it together with such ease. Your salad not only looks beautiful, but I’m sure it is both tasty and much healthier than pretty much anything your son could get on campus! Your first beautiful photo reminds me of when Gene and I stayed in Sorrento and took a gorgeous drive along the Amalfi coast to Poisanto – stunning scenery and great fun 🙂 Your tuna salad looks delicious! The Amalfi coast is on my bucket list Judi! I hear it is magnificent! 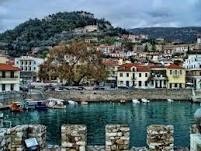 These photos are from Greece, the header on approach to Santorini and the other of Nafpaktos, a coastal village onmainland, near Delphi, where a best friend has a home. Got there 24 yrs ago. Time to go back! The foor of Greece has always stayed with me. So fresh yet so simple. Love it, Happy New Year! Sama as in Greece! I had callouses on my hands driving up and down those mountains too! I think that charm is still there. Let’s both go back and see, Judi! Thank you for reminding us that all this feasting is bound to end soon … on my bathroom scales! Well said Ginger as I head off to another holiday lunch w friends today! LOL. Happy Znew Year! the 7 grains rice looks like a great idea..
And happy ! Fiesta Friday! I love the whole grains especially when teying to be good:) but then I still have too many Christmas cookies still around to tempt me!! !